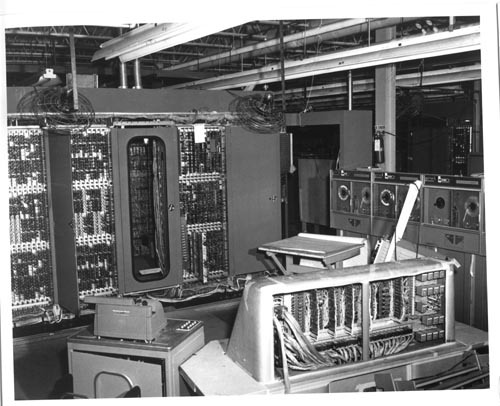 Black and white image of UNIVAC I system . In the foreground is the back of system console with cover removed to show wiring and components. To the right is a row of tape drives. Beside the console on the right is an oscilloscope and a drafting table with blueprints. To the colsole left is a typewriter sitting on a control cabinet. To the left reat is the system with covers removed. Hanging from ceiling are two fans.